Discover FastFund Online Nonprofit Partners authorized to resell our integrated Accounting, Fundraising and Payroll software solutions. Crouch & Associates helps nonprofits build a fundraising infrastructure with the necessary resources to fulfill their specific missions. We do this by coaching development staffs to perform at the highest level by enhancing their emotional intelligence and fundraising skills. Our ultimate goal is to impact the lives of individuals through our work. iATS Payments only focus is nonprofits. We provide nonprofits with the advanced capabilities they need to ensure donors’ payments are processed on time, safely, and securely. Operating in Canada for nearly 20 years, iATS aids more than 10,000 nonprofit clients around the world. Our expertise in online fundraising tools is unmatched, and being the largest nonprofit payment processor in the world, we can help nonprofits both large and small by providing support and technology along with industry knowledge developed over decades. Our goal is simple: Give nonprofits the tools they need to focus on what they do best – helping others. Financial Technologies and Management provides comprehensive accounting, software, and training solutions exclusively to nonprofit organizations. Our accounting software services will help you to assess and better utilize your software with implementation, training, and support services. We help our clients to improve financial operations while increasing organization capacity. Outfitters4 exists to assume the burdens of routine management so our nonprofit clients can focus on their missions. 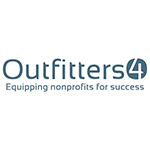 Outfitters4 is a full-service resource equipping nonprofits for success. We provide integrated support for all facets of organizational development and operations. DonorSearch DonorSearch is a leading prospect research and screening firm with the industry's largest and fastest growing philanthropic database. We're the only prospect research and screening firm to offer free, unlimited training and support, data integration with over 25 leading CRMs, free CFRE-approved webinars, unlimited use of our suite of prospect research tools and no per-seat charges. Market Smart Fundraising Report Card is a cloud based analytics & reporting platform for nonprofits that drill-downs on donor retention, donor churn, and produces interactive charts and visualizations that help make sense of donor data. Green Springs Coaching Green Springs Management, LLC has worked with behavioral healthcare non-profits for the last 30 years providing financial, information systems, EHR and organizational development consulting, and, executive leadership coaching. Believing that providing quality behavioral healthcare to clients is of the utmost importance, we work behind the scenes with the staff, the systems and the software to ensure that the focus and energy remains with quality client services. Diversify and grow your business by delivering a total, affordable solution to nonprofit organizations. Anetta Oppelt, Finance & Administration Director Child & Family Resources, Inc.
Sharon Delaney, Accountant, Village Ministries International, Inc.
Find out how FastFund Online can help your nonprofit become more accountable and fulfill your mission.